Many FreshSurf guests come to our surf camp, because they appreciate the calm and serenity. But sometimes our surf students also want to go to Corralejo, to drink a cocktail or two and to explore the clubs of the island. But we promise, you will stay in our small fishing village on the first weekend in July. Because at 4th and 5th July our little El Cotillo awakens. 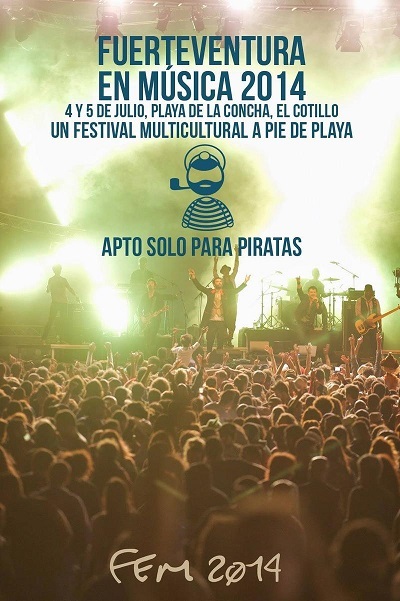 Fort the 11th time “Fuerte de Musica” is celebrated at the lagoon beach – an open-air, comparable with big events on the mainland. So if you like to have some good music around you and if you want to enjoy a nice music festival highlight, you should book quickly. We still have free rooms for the first week of July. By the way: The best places in front of the stage at the La Concha beach are always filled quickly. Headlining this year, the rap duo “Calle 13” from Puerto Rico. The band is well known not only for their music, but also for political and social engagement. But not only „Calle 13“ is coming, many national and international artists aswell. “Fuerte de Musica” stands for internationality and openness to the world and wants to show once again that it is possible, to celebrate a big festival like this, on a weekend under the starry sky of Fuerteventura. We are looking forward to see all of you at the lagoon beach.